That’s a familiar set of metaphors that are also strong and right. 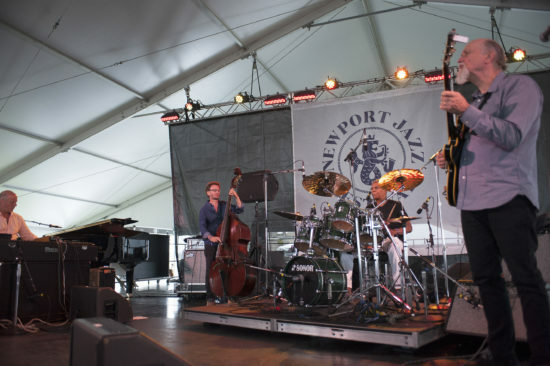 And they reflect the way McBride took to his first year as the artistic director of the Newport Jazz Festival, helming the venerable institution with its co-founder, George Wein. In many ways McBride is both a populist and a progressive, but you’d be nuts to say he hasn’t upheld jazz’s most righteous technical and cultural tenets. Just taking into consideration its final day, McBride’s Newport had it both ways and then some: modern-mainstream jazz headliners, slightly lower-profile postboppers, groove-jazz as interpreted by some of our best musicians, a taste of the avant-garde (a slighter presence than in previous years) and the Roots, the adult-friendly hip-hop band, led by McBride’s high-school pal Questlove, that has helped many a bona-fide jazz festival move a few more tickets. When the weather is fine at the festival site of Fort Adams State Park—as it was yesterday, with sun and a high of 77—the mind tends to wander. With overcast skies and a little drizzle, a critic has no problem hunkering down for a full set and copious note-taking. 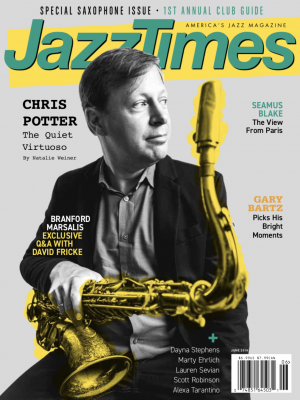 When you realize that you’re essentially walking inside an Edward Hopper landscape, meditations on the heady counterpoint of saxophonist Tim Berne’s Snakeoil take a backseat to other thoughts: How much does Jason Moran’s Fats Waller mask weigh? Does he ever wear it around the house to scare his kids? Are any of the many people here under the age of 23 not student musicians? And where is everyone getting these lemonades? Do I need a lemonade? I drank a soda 20 minutes ago. Is it too soon for lemonade? In other words, it becomes a festival as opposed to a series of hourlong sets. Sunday’s program, heavy on improvised music to be appreciated within rock and R&B tastes, dovetailed well with the goodtime vibes. Moran’s Fats Waller Dance Party fulfilled the promise of its name onstage and off, and that long-running big-head bit, which allows Moran to offer juicy historical tidbits in-character, never gets old. Cyrille Aimée mixed a clever loop-assisted solo arrangement of Bob Marley’s “Waiting in Vain” and a full-band take on Michael Jackson’s “Off the Wall” into her set of postmodern Gypsy-jazz—part stellar vocal-jazz, part Hot Club and part singer-songwriter, with an emphasis on letting a great guitar band do serious work. The supergroup Hudson hit precisely the marks you’d want from a band featuring drummer Jack DeJohnette, guitarist John Scofield, bassist Larry Grenadier and organist/pianist John Medeski. I caught a loud, elastic, cathartic take on Hendrix’s “Castles Made of Sand,” with Scofield covering the vocal melody in tasty Wes-style octaves before DeJohnette sang with fatherly, workmanlike charm. Hudson is in many ways an homage to a postwar generation raised on both acoustic jazz and the brilliant popular music of the 1960s, so Joni Mitchell’s “Woodstock,” approached as soulful midtempo postbop, came off as a kind of theme song, or mission statement. Hudson felt special, like a set that will mark this particular Newport against all the others. But the band still has a bunch of tour dates left. Far rarer was the fifth-ever gig by the Philadelphia Experiment, featuring McBride, mostly on electric bass, keyboardist Uri Caine and drummer Questlove, plus, for this set, turntablist DJ Logic, whose scratching fell into the mix impeccably. Due to Bokanté’s move to the main stage, caused by the illness-related cancellation of R&B singer Andra Day, the Experiment got a full hour-and-15 to stretch out with its powerfully backbeat-driven version of jazz-funk. The musicianship here was airtight: Caine, on Rhodes, proved how classically earned technique can enhance rather than detract from a naturally funky rhythmic sense; McBride’s solos were complete statements of melody and chops, with quotes that highlighted his encyclopedic jazz and R&B listening; and Questlove laid down an unmovable foundation while showing off his nimble way with displacement and the ability to morph grooves with the seamlessness of a club DJ. The spirit of the set, however, was as loose as the highest-quality barroom reminiscing. Questlove and McBride spent a lot of time giggling toward one another like the prank-loving, trash-talking chums they were at the Philadelphia High School for the Creative and Performing Arts during the 1980s. Some of the anecdotes—like driving their high-school orchestra director batty by fitting funky grooves into unlikely places—were flat-out funny. Other stories—like Questlove remembering the different musical recommendations he got from his schoolmates McBride, Kurt Rosenwinkel and Black Thought—were deeper, and helped to explain the current state of American jazz, hip-hop and R&B. As with McBride’s playing, bandleading and now curating, the history lessons went down easy.